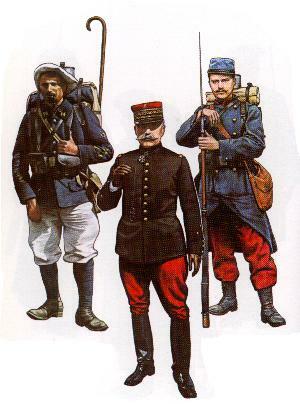 The French Army in World War One 1914-1918 – uniforms, strength, organization. 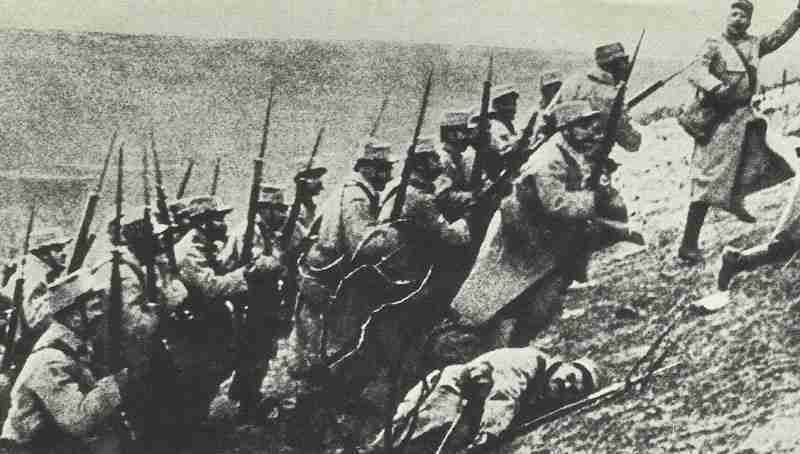 French infantry attack at the beginning of World War One. French soldiers 1914: Mountain rifleman, General, Infantryman. The populations of France and the North German Confederation had in 1870 been approximately equal, but by 1914, while the population of the German empire had risen to over 65,000,000, that of France was still under 40,000,000. The disparity dominated French strategic thinking, and, with tragic irony, led in the end to a military creed savagely extravagant of human life. France had astonished the world with the speed of her recovery after 1870. She had re-organized her army on the Prussian model with short service and a powerful general staff. Where the loss of Alsace and Lorraine had laid open her eastern frontier, she had built a strong fortified line stretch­ing from Belfort to Verdun. At the turn of the century the army had been racked and discredited by the Dreyfus Affair‘s outcome. In 1905 military service had been cut down to two years. Confronted with the rising menace of Germany, the prestige of the army and willingness to serve in it re­covered, and in 1913 service was restored to three years. After that men served in the Reserve, the Territorial Army and the Territorial Reserve for varying periods up to the age of forty-eight. In July 1914 the peace strength of the French army was 736,000. On mobilization it rose to 3,500,000, of which some 1,700,000 were in the field army of five armies, in all twenty-one army corps, plus two colonial, three independent, ten cavalry, and twenty-five reserve divisions, the rest in territorials, garrisons, and depots. The five armies stretched from the Swiss frontier, where the 1st Army had its right at Bel­fort, to a third of the way along the Bel­gian frontier, where the left of the 5th was near Hirson. Beyond that was a cavalry corps of three divisions. A German offensive from Metz would thus be covered, but one through Belgium would meet only a weak cavalry screen. The French, however, had no intention of waiting for any offensive to develop, for the army had persuaded itself that the disasters of 1870 had been due to lack of offensive spirit on their side. Looking back to Napoleonic and even earlier battles, the army had become imbued with mystical faith in the attack, pressed home regard­less of cost, as the answer to all military problems. 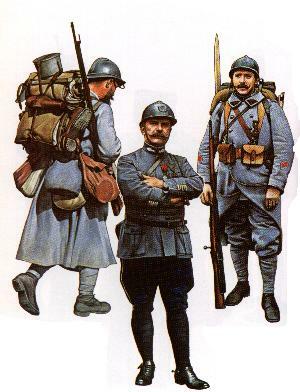 To ensure its elan, when the Germans went sensibly into field grey, the French had retained the traditional long blue coats and bright red trousers of their infantry. More practical matters were neglected, and the French infantryman wore his long coat and heavy military underwear even in the heat of August, his boots were hard, and a load of sixty-six pounds was piled on him compared to the German’s fifty-six. For fire power, the French relied on the rifle and the 75-mm field gun, an out­standing weapon produced, in large num­bers. Machine-guns were neglected. As for tactics, ‘Success depends’, said the manual of 1913, ‘far more on forcefulness and tenacity than upon tactical skill.’ Luckily the French soldier was not only brave but also adaptable and able to learn quickly, while the colonial empire, which during the war would supply 500,000 men, was available to replace some of the first shattering losses. General Joffre, sixty-two, was vice-presi­dent of the war council, earmarked as com­mander-in-chief on an outbreak of war. He had been appointed in 1911, largely because the disciples of attack wished to get rid of his predecessor. Ponderous, very taciturn, but a good listener, veteran of colonial service, he had no strong views on strategy or tactics, but was an engineer, and expert in military movement. He was to prove imperturbable and able in crisis, but did nothing before the war to check the ideas and plans that made crisis inevitable when war came. Gallieni, Joffre’s superior in the colonies, more alert and realistic, had refused the appointment, and was now without military employment. Of the army commanders, Lanrezac of the 5th Army, brilliant, pessimistic, im­patient, and outspoken, was thought of by many as Joffre’s eventual successor. Foch, responsible as commandant of the staff college for spreading the doctrine of attack, was a corps commander. Like Joffre he would be strong in crisis, and had in Wey­gand a chief of staff who could translate his wishes into clear orders. Petain, out m-­favour for his realistic belief in fire power, commanded just a division.